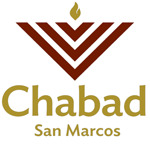 Donate to Chabad San Marcos today! Thanks for being a part of Chabad and sharing in our vision for a Jewish community in San Marcos. Your contribution enables us to build a place of learning, warmth, and friendship in our corner of the Hill Country.